It’s easy to dispute BMW’s usual term Life Cycle Improvement when it comes to the facelift of the new 7 Series, which will . Just look at that massive grille. Is that really an improvement? It’s already been heavily criticized as being the opposite of an improvement. But then you discover that 44% of all 7 Series models sold in 2018 went to Asia, China in particular. The Chinese love it, they asked for it. At the launch of the facelifted 7 in Portugal this week, Susanne Martin, BMW’s product manager for the model told Cartownhack that Asian markets told her they wanted it to have more presence, more novelty and above all they want the 7 to look different to the 5 Series. That it does. Beauty is in the eye of the beholder and all that and no doubt there will be those that like it, just as there are those that like the massive grille on the Lexus LS or the Audi A8. They need to, because the US is the second biggest market for the 7 Series after China. Having given the front a grilling, the rear has been redesigned too, with new L-shaped lighting and a full-width daytime light strip. The blade behind the front wheel arch has been made more vertical, apparently at the request of Asian markets too while there are now two design lines available in the form of Excellence or the M package. The former features more chrome, the latter a more aggressive front end and the usual sporty M detailing. The US will get five different variants of the 7, including the rear-wheel-drive 740i, xDrive all-wheel-drive versions of the 740i and 750i as well as the stonking V12 M760i. All will be long-wheelbase models as will be the 745e xDrive plug-in hybrid (PHEV) which gets a brand new six-cylinder inline engine delivering a combined output of 375 horsepower with an additional 14 hp available in Sport mode and a combined torque figure of 442 Ib-ft. BMW is claiming an electric-only range on the 745e of 34 miles and consumption of up to 134.5 mpg. The engine in the 740i is carried over from the pre-facelift version, offering 335 hp and 330 lb-ft which gives the rear-wheel drive version a 0-60 mph time of 5.3 seconds and the xDrive model a sprint to 60 mph time of 4.8 seconds. The 750Li on the other hand gets a completely reworked V8 with two twin-scroll turbos bolted on. The combination delivers 523 hp, 80 more than the old model and torque is also up by 74 lb-ft to 553. BMW is claiming a 0-60 mph time of just 3.9 seconds for this luxury barge and a consumption figure of 29.7 mpg. Then there is the M760i, the one proudly still wearing an illustrious V12 bangle on the flank of the c-pillar. It’s a devil in a suit as you would expect, delivering 600 hp, 627 lb-ft and a sprint to 60 mph in 3.6 seconds, although consumption is not its forte at 22.8 mpg. However, it does have a soundtrack to match its performance, although not in a ground-shaking AMG kind of way. Some of the biggest changes are in the interior, where as you would expect, things have become even more luxurious. There’s new leather featuring stitching that is even more upmarket and you get up to 44.4 inches of rear legroom. The seats sit higher too, giving you a better view out of the front. This is because all models have the same packaging beneath the rear seats that in the PHEV accommodates the batteries. The seats feature multiple adjustments and you get individual touchscreens mounted on the back of the front headrests as well as the removable tablet in the centre armrest. Even those sitting up front have lots of space and access to new technology, particularly for the driver. If you thought the remote parking using that brick of a key fob was cool in the old one, then wait until you try the Reversing Assistant. The car remembers the last 165 feet you drove and should you suddenly find yourself needing to retrace your tracks, say for example you forgot something at home or came across a garbage truck blocking the street, put the car in reverse, engage Reversing Assistant, take your hands off the wheel and the 7 Series will reverse back along the route you just came. You have to use the throttle and the brake, but damn its clever and rather fun too. There’s also the latest version of the BMW Operating System 7.0 which includes updates to gesture control. Carolin Raabe, product genius (yes, that’s really her job title) for the system explained that there are new gestures for telling the navigation to direct you home and for skipping through music tracks. The system is still a little temperamental though and it can be rather hit and miss. The same is true of the Intelligent Personal Assistant, which you can call on by saying "Hey BMW” or another name if you have changed it. When it works it can be useful but hear it say it doesn't understand you a couple of times then it’s easy to just give up on it. If you do get it right then l and , you can call on what Rainer Thoma, head of project 7 Series, says is called Caring Car - tell it you’re tired and it will select uplifting music and change the interior climate settings. Tell it you want to relax and it will do the opposite. To some, it will sound gimmicky but to others, it will rate highly on the cool tech scale and that's not something you would have expected in a 7 Series a few years ago. What there isn’t is that Swarovski crystal gearstick that debuted on the X7 and new . Not that we mind, again it’s a love it or hate it thing. But in the case of the 7 Series, the electrical architecture could not accommodate it, this is, after all, a facelift rather than an all-new platform. Trunk space remains the same as pre-facelift versions at 18.2 cubic feet, but as is typical of hybrid models, it’s more compromised in the 745e where it comes down to 14.8 cubic feet. But storage is about more than just the trunk and the 7 has loads of storage around the cabin. There are cupholders in the centre console, in the rear centre armrest and more space for small bottles and other paraphernalia in the door pockets. The big storage spaces in the rear armrest contains a small table, like those ones that fold out of the seats on an airplane, providing you with something to put your laptop on as you work at speed. Traditional elements also remain, like the map pockets on the back of the front seats and there’s a wireless charging pad ticked beneath the dash in the centre console up front. In some ways the latest 7 Series is new and in others more of the same but how does it drive? Surely it’s a given that it carries you along in cosseting elegance? Well yes and no. We drove the 750Li and the 745e, both delivering instant torque and great dynamics, as you would expect of a BMW, even one more focused on luxury than tackling twisty Portuguese roads. But it can be wafty, very wafty in fact, leading to you feeling a little sea sick especially if you are relaxing in the back trying to read. We found a solution though - switch the dynamics into Individual mode, select Sport on the damping and Comfort on everything else and it improves dramatically. Yes, it means a slightly firmer ride but what the tech laden 7 Series doesn’t come with is a sick bag. Motion sickness aside the 7 is luxurious, it cruises superbly especially if you engage the various driver assistance systems and let it do some of the work for you and it’s full of useful and not so useful tech. It is a proper piece of executive engineering. You’ll pay for all that luxury of course. The range starts at $86,450 for the 740i with the xDrive version at $89,450. Go for the PHEV and you’ll be shelling out $95,550 and then you get into the bigger numbers. 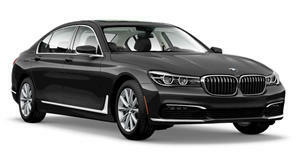 The 750i is tagged at $102,650 and the M760i at $157,700. But this is a BMW so who no-one pays the standard prices, they add options, loads of them. The list is typically long but there are also packages like the Autobahn Package which includes Integral Active Steering and Active Comfort Drive ($4,100), the Premium Package with Nappa leather ($3,000) or the Executive Package with a Panoramic Sky Lounge LED roof ($2,500). If you want the real business class experience then the Rear Executive Lounge Seating Package ($5,750 and only on the 750i and M760i) provides you with reclining seats, a footrest and the Rear Seat Entertainment Professional system. And if you want your seven to look more sporty then the M Sport Package is available from $3,000. There’s no denying that there will be those put off by the styling, but there will be others attracted to it because of its increased presence. The new 7 Series is certainly not short on tech and you’ll be showing your friends and neighbors the Reversing Assistant at every opportunity. It’s got even more luxury and those rear seats are so comfortable that if you are okay with the suspension then you’ll want to just keep driving, or ask your driver to. Compared to the Audi A8 and until the new Mercedes-Benz S-Class comes along, the BMW 7 Series is undeniably the benchmark German executive.